Six Brenner Beer featured artists in the inaugural exhibition of ART/BEER Lounge opening on Saturday, September 10, 3-6 p.m. Opening Reception: Saturday, September 10, 3-6 p.m.
Brenner Brewing and The Pitch Project would like to announce the launch of a new shared space that will highlight Brenner Brewing’s commitment to supporting the Milwaukee arts community. Through continued sponsorship of The Pitch Project Gallery and Studios as well as commissioning original artwork for all of the brewery’s beer labels, Brenner Beer has demonstrated its unwavering support of a thriving artistic community in Milwaukee, WI. The inaugural show in the new ART/BEER Lounge will feature the original artwork commissioned by Brenner for each of his beers as well as new work by each of those Milwaukee artists. Over the course of the next year the Pitch Project Art/Beer Lounge will host solo exhibitions to: Sue Lawton (Star Baby IPA), Skully Gustafson (Butterfly Farts Citrus Ale), James Demski (Bacon Bomb Rauchbier), Della Wells (Witchcraft Bourbon Barrel Aged Imperial Stout), Erin Paisley (City Fox Pale Ale), and Ric Stultz (Affenkönig Hopfenweisse). 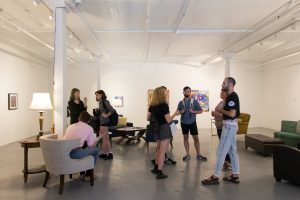 The new art/beer lounge is located in the heart of The Pitch Project, surrounded by 20 artist studios and adjacent to a new Pitch Project Gallery, opening an installation by Chicago based artist Mike Rea on September 10, 2016. For more information you can contact the gallery at info@thepitchproject.com. Skully Gustafson received his BFA in Integrated Studio Arts from the Milwaukee Institute of Art and Design (MIAD) in 2012 as well as studied for a semester at the New York Studio Residency Program in Brooklyn, NY. Gustafson, aka Skully Skyrocket, makes work that draws from human environments. Found objects and materials are sculpted together, painted, collaged and pasted on the floors, walls, and ceilings to create space that is foreign to the viewer and to remove oneself from the familiar. He is the artist of Brenner Brewing Co.’s Butterfly Farts Citrus Ale label and six-pack case design. Sue Lawton is an artist and writer from the Milwaukee area and considers her job a balance between “showing” and “telling”. Since receiving her BFA from Cardinal Stritch in 2002, she has worked extensively with images and stories. In 2011 she published her first book “The Circus and the Cyclone” and in 2014 created “The Fire Keepers” in conjunction with a residency at the Sharon Lynne Wilson Center for the Arts. Sue is currently a resident at RedLine Milwaukee where she continues to write and create visual works. She is the artist of Brenner Brewing Co.’s Rocket Baby IPA label and six-pack case design. James “Jimbot” Demski is a freelance artist whose influence comes from his childhood, and the fears that followed him as he grew up. Influence from cartoons, comics, toys, fun, insecurities, happiness and anger all intermingle and flow in his work. Much of Jimbot’s work is not easily interpreted by the viewer and he welcomes his audience to take everything he has put out there and let them establish their own ideas of his world; much like we are left to interpret the real world on our own. He is the artist of Brenner Brewing Co.’s Bacon Bomb Rauchbier label and six-pack case design. Della Wells is a visual storyteller who resides in Milwaukee, WI. As a child, she made up stories and characters, many based on her mother’s recollections of growing up in North Carolina during the 1920s, 1930s and 1940s. Wells used these stories to escape the madness of her mother’s mental illness and her father’s rage and eventually used them to inspire the collage art she creates today. Della Wells was awarded Milwaukee Artist of the Year in 2016. She is the artist of Brenner Brewing Co.’s Witchcraft Bourbon Barrel Aged Imperial Stout label and six-pack case design. Ric Stultz draws and paints daily in his Milwaukee studio. His bright colors and pop culture imagery are built from a childhood steeped in cartoons, video games, and comic books. Incorporating adult interests in graphic design, illustration, and fine art, Ric’s work willfully evades easy categorization. Commercially his images have been used by dozens of clients, including Nike and MTV. His paintings have been exhibited widely, including group shows in New York, Los Angeles, and London. He is the artist of Brenner Brewing Co.’s Affenkönig Hopfenweisse label and six-pack case design. Erin Paisley is a self-taught painter, ceramicist and fiber artist from Milwaukee, WI. Her whimsical, bittersweet work is inspired by everything from childhood nostalgia to Old World European craftsmanship. She is the artist of Brenner Brewing Co.’s City Fox Pale Ale label and six-pack case design.